The China House offers Regional Chinese specialties from Guangdong, Szechuan, Hunan and Beijing. The Bel Cibo brings out the most ideal atmosphere for an amazing Italian experience. Relax away from the Hustle and Bustle of the City on a short river cruises or sunset cruises along the Phnom Penh riverfront. A cruise typically takes about 1-2 hours and run up the Tonle Sap River along the central riverfront area providing a stunning view of the Royal Palace, National Museum, Riverside, and Phnom Penh skyline, and then across the Tonle Sap and up the Mekong River to view floating fishing villages. 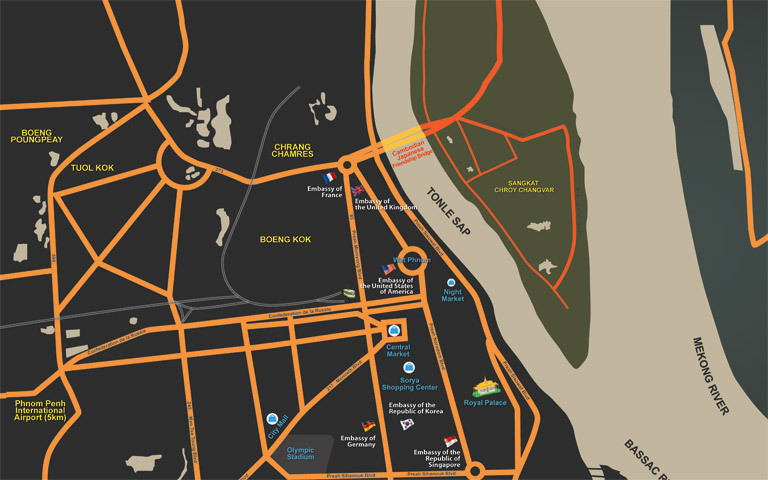 Take a silently Cyclo tour and explore Phnom Penh's busiest streets and major landmarks and points of interest. You can plan your own route or leave it up to your cyclo driver. Contact our Concierge for more details information. Enjoy a leisurely bike ride on a less busy road to the near attractions to discover the real Cambodian smile! You can also join biking tour to the nearby Silk Islands to get rural fresh air and serene greenery view of Cambodian countryside. Street 178 has long been known as 'Art Street' for the local sculpture shops and art galleries that line the road near the National Museum and Royal University of Fine Arts. Sculptors work on the street next to Wat Sarawan and the local galleries clustered near the Museum, most focusing on commercial and popular Cambodian art. Street 240's tree shaded avenue harbors a unique collection of quality boutiques and souvenir shops, offering Cambodian silks and silk fashions, Southeast Asian art, handicrafts, and furniture. There are a few restaurants, bars, wine shops, bookstores, and travel agencies interspersed along the way. After visiting the Royal Palace, stroll around the corner to explore Street 240. Toul Tum Poung market or Russian Market is the most popular market among tourists and expats. It is probably the best place to pick up souvenirs. you will find everything from beautifully hand carved statues, colorful lanterns and handmade silk scarves to printed T-shirts and DVDs. Russian market is located in the south part of Phnom Penh and about 10km from the hotel. Prior to 1975, Toul Sleng was a high school and when the Khmer Rough came to power the school was converted into the S-21 prison and interrogation facility. For historical context, take a visit to Toul Sleng Genocide Museum where take about 8km from the hotel. Choeung Ek was once an orchard and a Chinese graveyard. It was used by the Khmer Rouge regime as an execution ground to put down thousands of people between 1975 and 1979. The site is now better known as the Killing Fields. Mass graves containing thousands of bodies were discovered at Choeung Ek after the fall of the Khmer Rouge regime. Many of the dead were former inmates in the Tuol Sleng prison. It is located about 17km south of Phnom Penh.